Is there Life After Ebola? Some documentation of Jamaican responses to the possiblity of an Ebola outbreak here. I hope someone somewhere is keeping track of the way different countries and cultures have reacted to the news of a possible Ebola pandemic. I will do my bit by documenting a representative sample of some Jamaican responses here. In general there has been an air of barely controlled hysteria, perhaps understandable in a population already ravaged by a pestilential disease called Chikungunya which crept up on us virtually unannounced about two months ago. The entire months of September and October were lost to Chik V as the mosquito-borne illness is nicknamed and perhaps November too, so long-lasting are the effects of this peculiar virus. The word Ebola first started being bandied about by Jamaican media in August and escalated in frequency after news broke that a Texas hospital in the United States was housing an Ebola patient who had just returned from Liberia. In early August Trinidad and Tobago entered panic mode and isolated a flight from London because it was carrying a Nigerian doctor married to a Trinidadian. It was later discovered that the doctor had not set foot in Africa in the last five years. In mid-September the permanent secretary in the Ministry of Health here was forced to issue a statement denying that Jamaica had received its first Ebola case. The hysteria continued to build with Jamaican doctors announcing that in the absence of appropriate protective gear they would not be turning up to treat Ebola patients. Meanwhile neighbouring Cuba announced that it was sending nearly 500 medics to West Africa to help fight the deadly disease. “…the Nigerian presented himself at the hospital at 5 o’clock yesterday morning, sweating profusely and vomiting. He was reportedly placed in isolation in one of the rooms in the Accident and Emergency Department and was seen by a nurse, who was not told of the man’s history. 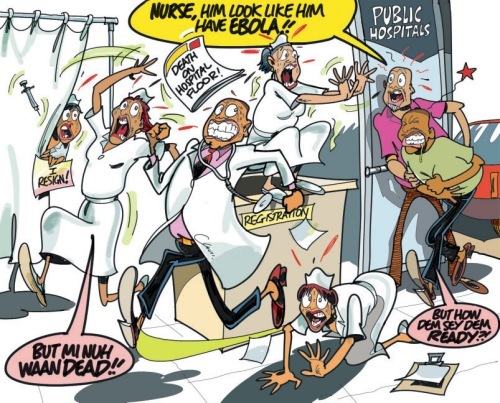 “Dr Bob Banjo, who has resided in Jamaica for the last 28 years, blasted nurses and other employees at the hospital as being ill-prepared for an Ebola outbreak and described how some became hysterical after he revealed that he had travelled to his homeland in July. Banjo, in recounting his ordeal to The Gleaner yesterday, admitted that he had dizzy spells and was sweating profusely when he turned up at the hospital and said the doctor on duty assigned a nurse to take his temperature and blood pressure. He said the test showed that his blood pressure was high, prompting the nurse to ask him if he had travelled overseas this year. Banjo said he admitted to visiting Nigeria from July 16 to August 27 and recounted the panic and hysteria that followed. “The moment I told the nurse I travelled to Nigeria, she ran out and told the doctor [and] the whole hospital – even patients and the staff. They went haywire,” he recounted. “Jamaican medic Dr Coril Curtis-Warmington has urged colleagues in Jamaica to join her in Liberia, one of the countries at the epicentre of the Ebola outbreak, to get first-hand experience in treating the deadly virus which has already claimed more than 5,000 lives. Curtis-Warmington made the call last Friday as she spoke by Skype from Liberia to the 10th annual scientific symposium and general meeting of the Caribbean Association of Clinical Microbiologists, held at the University Hospital of the West Indies. “It is not easy, but even short term, just for two weeks. Please consider it because we really need you,” she begged in her final comments at the end of the 45-minute link. “Nonetheless, we believe that Jamaica – which used to pride itself as a leader among developing countries – has the capacity, and indeed an obligation, to do more – even if only symbolically. First, the vast majority of Jamaicans have their roots in that part of Africa, the region of the Gold Coast, from where most of the slaves to the New World arrived. In that sense, the victims of Ebola on the African continent are Jamaica’s kith and kin, claimed in popular culture and strategically embraced as part of a geopolitical insulation against the buffeting by the powerful of the world. Yet, in stark contrast to neighbouring Cuba, which has sent hundreds of health workers to the three worst-hit countries, and from which this country has sought help in crafting an Ebola plan, the Jamaican authorities have offered them nothing – at least nothing that the country has been told about. A public declaration of sympathy is the least that the Government could do. Moreover, Jamaica, which has responsibility for foreign relations within the Caribbean Community, would be expected to be mobilising the Community to a shared response, including, possibly, medical assistance and/or logistical and security support. At a private level, there is no sense of Jamaican health workers – neither doctors nor nurses – volunteering, like their counterpart in other countries, to work in Liberia, Sierra Leone or Guinea. They, as one Jamaican doctor resident in Liberia told this newspaper, are needed and would be welcomed. Nor are there any projects to raise money to help these governments finance their anti-Ebola efforts or for relief for the survivors of the disease. Surely a people that pride themselves on having the most churches per square foot in the world should have a more humane, enlightened and charitable response toward sufferers of this latter day plague? Alas, there is no direct correlation between piety and charity. There may be an inverse relationship. Pious people can always find a pious reason for not being charitable.